When the history books record the evolution of modern bicycle drivetrains, they will inform the reader that each of the major brands had a spotlight moment to call their own. Discounting Mavic’s on-again/off-again dive into an electronic drivetrain that started way back in 1993, the notable leaps in drivetrain designs over the years came from Campagnolo, Shimano and SRAM as they shadowed each other with the incremental addition of added gears. By the time our 10-speed bikes actually accrued 10 gears, most of us figured that, owing to the limits of rear-wheel spacing, all was well and good with the amount of gears we had. However, there were obviously still those who figured there had to be some other recipe of drivetrain technology that had yet to be served up. And so there was. In 2008 Campagnolo rolled out an 11-speed cluster. The following year Shimano introduced electronics with their Dura-Ace Di2 system. In 2011 those old-world stalwarts in Vicenza, Italy, proved just as capable with high-tech wizardry by also jumping on the battery bandwagon with their EPS drivetrain. 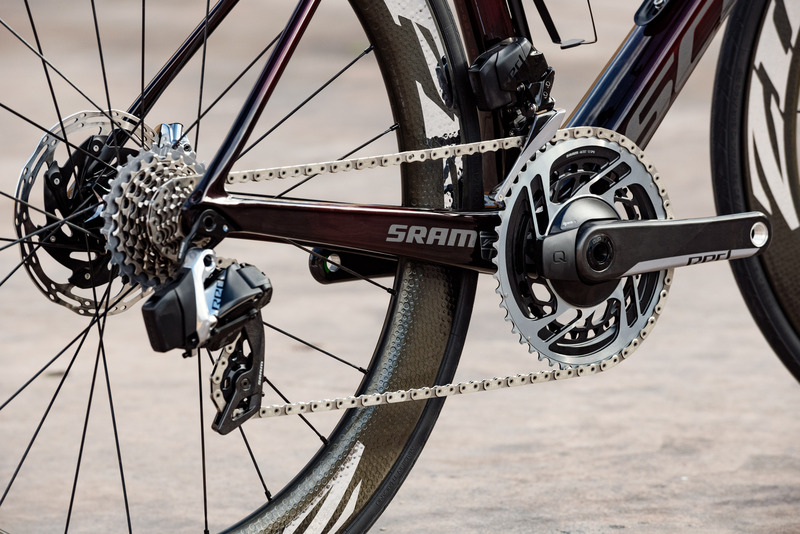 SRAM then made the sole leap into wireless drivetrains with their eTap system in 2015. Oh yeah, and then last year Campy jumped out with the first 12-speed road cluster. As new product launches go, SRAM was able to keep a tight lid on the contents of their Tucson soirée. Since the invite included a RockShox logo on it, some of the more gravel inclined among us relished the idea that a new, short-travel suspension fork would be unveiled. Nope. In short, after all these years of changes being made to the traditional road bike drivetrain, SRAM is hitting the 2019 season hard with a massive redo in both drivetrain concept and design. Yes, the new Red eTap AXS components still rely on the usual assemblage of cranks, chainrings, cogs, derailleurs and a chain, but there’s a lot more to it than just those parts. 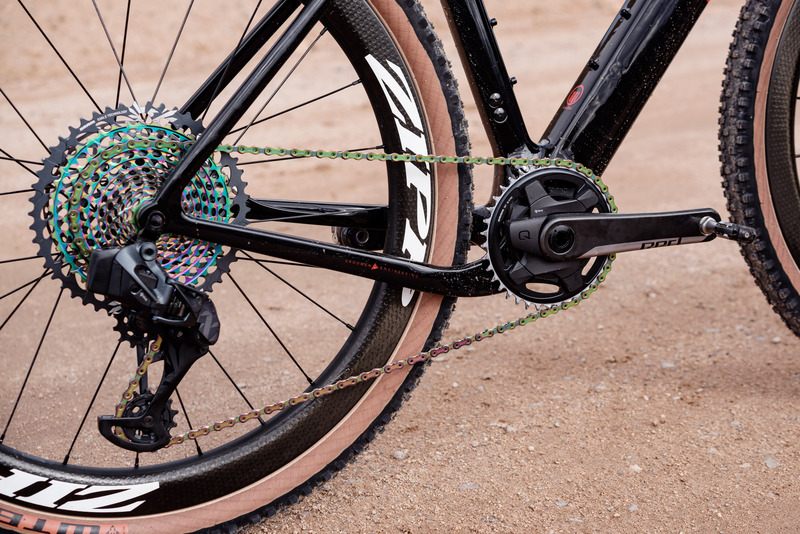 Apparently, for the last few seasons, SRAM has not only been looking at how drivetrains have evolved, but more important, how the cyclist’s ride experience itself has changed. And yes (sorry, haters), it goes without saying that the popularity of dual-purpose/gravel riding has played an instigating role. 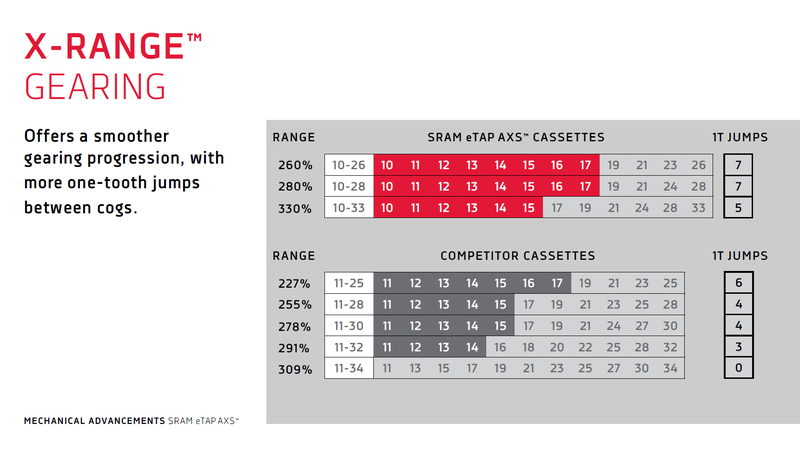 Amid all the PowerPoint slides and handheld visual aids, it was apparent that since the original eTap was released, SRAM has indeed been quite busy these last few seasons. 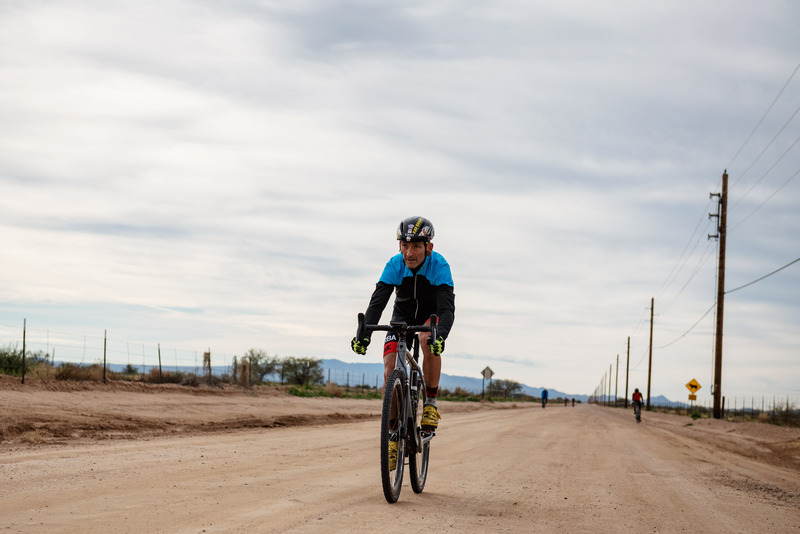 From the new disc brake rotors to the fluid vanes in the rear derailleur, to say there was a prodigious amount of tech info to digest would be an understatement. As much as all the electronic and phone-app compatibility plays a role in the AXS (as in “access”) parts, there are two key components that comprise the new X-Range drivetrain: 1. The use of an XDR driver, which allows for the dedicated use of a 10-tooth cog, and most important, 2. A redrawing of the amount of (fewer) teeth used on the chainrings. Between the three available cassettes (10-26, 10-28 and 10-33) and three chainring combos (46/33, 48/35 and 50/37), the byproduct of these reimagined gear combos is a newfound and improved pedaling efficiency on both the top and bottom of the gear range. SRAM’s stated goal here is simply to keep you in the big ring longer. Additionally, by maintaining a 13t delta on all three chainring combos (versus the previous 14t delta), the front shifts are intended to come quicker and easier.